Are you exploring the world of dehydrated vegetables? Many gardeners are these days, including me. This is fairly new territory, but one that is expanding quickly for two reasons: (1) Health foodies are discovering the joy of seasoned veggie chips made in the oven or the dehydrator. (2) Seasoned gardeners are expanding their gardens in response to food prices. This leads to an over-loaded freezer and shelves for canned goods. More dehydrating is an answer to the dilemma. About okra: It does dehydrate well. Slice the okra into rounds as you would for frying. Lay it out in single layers on the dehydrating shelves. Dehydrate until crisp, about 24 hours. Set the heat at 130 (if possible) and set the timer for 24 hours. From the 24 hour point your okra may need more time. Check it every couple of hours and continue until the pods are crispy. The okra shrivels into tiny circles, a bit shocking at first because they are so small. You never think of okra having that much moisture in it. After the okra is dried, I recommend placing it in a freezer bag and freezing for a couple of days to kill off any organisms sensitive to cold that could have survived the warmth of the dehydrator. This little trick is probably more important for those food items that are sun-dried, like fruit and tomatoes. Regardless, I have used this method for years and have had no problem with bugs getting started in my jars of dried food. After a couple of days in the freezer, transfer the dried okra to a container with a tight-fighting lid. I prefer glass. It’s so satisfying to gaze on a shelf of glass jars filled with various dried foods. Search online and you will realize how many are using whole okra pods to dehydrate into snack food. This may be just right for you. I would have crossed this snack off the list because of the texture — it is a bit tough. But my three-year-old grandson kept getting into the dehydrator. He ate half the okra pods before they were entirely dry. Give it a try. 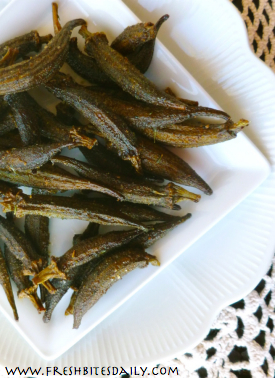 Dried seasoned okra may be just the snack for you. The seasoning I used is one I found online, a Cajun mix that we are loving. Wash the okra pods. Leave on the tips and the stems, spread out the okra to thoroughly dry before proceeding. Mix your seasonings in a bowl. This will be more than you want to use on the okra. However, once you smell this mix, you will be trying it on everything from avocado to zucchini. Store any leftover mix in a glass jar with a tight-fitting lid and keep it handy. Drizzle the olive oil over the dried okra pods and sprinkle with cajun seasoning. Season as heavily as you think you and yours will appreciate. A tablespoon or two should do it. Spread the okra pods on the dehydrator sheet, not touching one another. You want plenty of room for the warm air to circulate. Set the heat at 130 and set the timer for 24 hours. From the 24 hour point your okra may need more time. Check it every couple of hours and continue until the pods are crispy. Okra dehydrates well with these simple steps. Dehydrate until crisp, about 24 hours. Set the heat at 130 (if possible) and set the timer for 24 hours. Check the okra every couple of hours and continue until the pods are crispy. Freeze the okra for a couple of days before storing. Transfer dried and frozen okra to a jar with a tight-fitting lid for long-term storage.